Economics, Sociology, Psychology, Social Psychology, Political Science, Anthropology and More. The Social and Behavioral Design and Design Research Competition is an academic / semi-academic design & research competition open to submissions of academic papers, poster presentations and research findings and visualization of research results by design professionals, academics, researchers, and prospective researches in social and Behavioral sciences worldwide. The A' Design Award for Social and Behavioral Sciences is not just an award, it is the indicator of quality and perfection in research, the award is recognized worldwide and takes the attention of design oriented companies, professionals and interest groups. Winning the A' Award is a certificate of excellence for designers and researchers, an important milestone in your career. Having the A' Award attracts the eyes of design oriented companies and other academics worldwide, winners will be able to find better and higher profile offers, get a step ahead in their life. The winners of the A' Advanced Social and Behavioral Sciences Award are provided extensive and exclusive marketing and communication services to promote the success of winning the A' Award. Proceedings will be published and the winning submissions appear on the A' best designs book which is available worldwide, this book is furthermore distributed to the high-profile magazine editors, design oriented companies and relevant parties. The winning submissions are also exhibited at our museum in the form of a poster, and the best designs will be picked for the permanent exhibition. The winners appear on magazines, newspapers, webzines and many other publishing mediums. The Social and Behavioral Sciences Research Award is for people who makes a research on Social and Behavioral Sciences in order to form, model, organize, existing knowhow, and in order to create new information, theories and literature in the field. The Award was founded by an international advisory board experienced in advanced design studies, and dedicated to the proposition that the researchers incorporating design approach deserve a great honoring experience and award to highlight them. 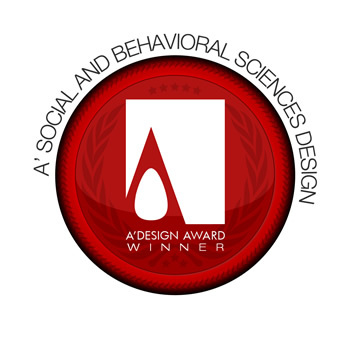 The A' Social and Behavioral Sciences Award also works as platform for Advanced Design Conference to collect and filter submissions. You should write a paper or submit your paper that covers research in Social and Behavioral Sciences. Existing and previous research up to 5 years, can also be submitted. A neat presentation is always required. The primary aim of the Social and Behavioral Sciences Award is to develop literature in the field, and to award leading researchers. Entries in this competition will be peer-reviewed and proceedings will be published separately, furthermore winners will also be eligible to join Advanced Design Conference with discount. Selection is based on Seven (7) Criteria: 1. Coherence : Your research should cover implementation of design in Social and Behavioral Sciences. 2. Methodology: Your submission should clearly explain the methodology used (either new or pre-existing) and must also support your decision of the used methodology based on evidence that it is coherent and related with the aims of your research. 3. Data Consistency: You should indicate how the data was collected and if this data are well selected and related to your topic and whether if your data are consistent. 4. Original Contribution and Critical Qualities: Your research topic should either cover a contemporary and fashionable topic, or should re-cover an old topic in a new way. It must be interesting and should provide new, uncovered knowledge in the field; it should fill a gap of knowledge. Finally, it should also critically demonstrate self-awareness of your own perspectives and interests. 5. Bibliographic Richness and Use of Existing Knowledge: Literature Review: Your submission should demonstrate an adequate understanding of the current literature. Your references should be relevant and good. 6. Clarity: Your submission should be clearly demonstrating a point; with conclusions etc. 7. Design of the Poster. You should be able to make a visual demonstration of your research in the form of a poster. Researchers and Academics interested in Social and Behavioral Sciences can and should join. The award especially targets an audience with a solid academic background. Social and Behavioral Sciences researchers, lecturers, professors, academics, Ph.D. students and social and Behavioral sciences students are welcome. Entries will be published in the Social and Behavioral Sciences index in Advanced Design Journal. Different than other journals which sell your research & papers, we will provide free download possibility for everyone who might be interested in downloading your papers, this not only increases the dissemination of your research findings but also provides additional citations for your research. Main Image* 3600 x 3600 pixels JPEG Poster: Very well made, visual presentation of your design research. Optional Image #1 1800 x 1800 pixels JPEG Additonal Poster Page: A focused presentation of results in your research. Optional Image #2 1800 x 1800 pixels JPEG Additonal Poster Page: A focused presentation of results in your research. Optional Image #3 1800 x 1800 pixels JPEG Additonal Poster Page: A focused presentation of results in your research. Optional Image #4 1800 x 1800 pixels JPEG Additonal Poster Page: A focused presentation of results in your research. Documentation* Max. 40 x A4 Pages PDF Your Paper Submission (The Full Article). Should use the submission template. Video File Max. 10 MB. 45 Sec. AVI A movie of your research presentation or other relevant material. Documentation Max. 40 x A4 Pages PDF Click to download the Submission Template in MS Word Format that should be used to prepare the Documentation PDF for Social and Behavioral Sciences Research Category.